This spring, watch for The Salt Line, at 79 Potomac Ave. SE, a New England-style fish house on the waterfront across from Nationals Park. Sprawled in the Dock 79 development, the 3,500-square space will have an expansive dining room, outdoor seating, private party space, and riverfront bar. Inspired by New England cuisine, executive chef Kyle Bailey’s menu will showcase seafood charcuterie, crudos, and raw bar selections. The cocktail and craft beer list draws heavily from Northeast and local breweries. Joining Bailey is chef de cuisine Mike O’Brien, who has wielded his whisk at upscale restaurants in upstate New York, California, and the Washington area. For updates visit www.thesaltline.com. Due to arrive at the $2 billion, mile-long Wharf on the Southwest waterfront: Mi Vida (“My Life,” or “My Loved One”). Created by Chef Roberto Santibanez, the 9,500-square-foot restaurant will be located adjacent to The Anthem, the Wharf’s 6,000-seat music venue. A Native of Mexico City, Santibanez also operates the Fonda restaurants in New York. Look for Mi Vida around the end of the year. Passover begins at sundown on April 10, and Teddy & The Bully Bar, a PRG Hospitality restaurant, invites Jews and non-Jews alike to a Passover dinner. Available on April 10 and 11, the seder menu will feature matzo ball soup with diced chicken, carrots, celery, and dill, along with chef Demetrio Zavala’s contemporary interpretations of traditional Jewish dishes. Priced at $45 for adults and $21 for children 12 and under, the dinner will consist of three courses with multiple options. Teddy is located at 1200 19th St. NW; call 202-872-8700 or visit www.teddyandthebullybar.com. Late next year, when its building is finished, look for the first offshoot of Union Square Cafe. Operated by Danny Meyer, who also has the ubiquitous Shake Shack, the Manhattan-based enterprise will occupy the ground level at 200 Massachusetts Ave. NW, part of the massive Capitol Crossing project that looms between Capitol Hill and Chinatown. The entire complex should be completed by 2022. It’s been about three months since Joselito: Casa de Comidas arrived at 660 Pennsylvania Ave. SE. Since then proprietors Javier Candon and Christiana Campos have hosted VIP guests, developed relationships with the neighborhood, and established a base of regulars. They have continued training their team and perfecting details. Joselito has also introduced chef David Sierra’s Menu del Dia, a prix-fixe lunch priced at $25, as well as daily specials. The three-course repast, which includes a glass of wine or a beer, is a really good deal. At a recent lunch with my Red Hat group, I chose an intriguing salad of avocado, orange slices, jicama, tomatoes (unfortunately winter-vapid), and candied mango. My entree was skate wing, moist and flavorful with an oddly appealing texture. Other options include fish stew, hanger steak, roasted vegetables, and torrejas (Spanish-style bread pudding). Warning: decibel level can get high. Joselito is open daily; call 202-930-6955 or visit www.joselitodc.com. Peter and I recently enjoyed an exotic culinary adventure in Union Market. At Toli Moli, a Burmese eatery, Peter took advantage of a luncheon special: a spicy coconut/mushroom noodle stew capped with a hardboiled egg slice, accompanied by frozen berry tea. The dessert was falooda, a layered, parfait-like melange of mango, gelato, almond milk, rosewater and of all things basil seeds. Falooda is a popular street snack in Southeast Asia and the Middle East, co-owner Jocelyn Law-Yone told us. The tasty repast came to about $16 including tax. By the way, Toli Moli means “A little of this and a little of that.” Located at 1309 Fifth St. NE, Union Market is closed Mondays. Congrats and good luck to Pineapple and Pearls, 715 Eighth St. SE, nominated by the 2017 James Beard Foundation Restaurant and Chef Awards as Best New Restaurant. Winners will be announced on May 1 in Chicago. Belga Cafe has unveiled a wallet-friendly happy hour and other specials. Monday through Friday, from 2:30 to 6:30 p.m., and Sunday from 4 ‘til closing, cocktails, wine by the glass, draft beers, and assorted tidbits are 50 percent off. On Tuesday a bucket of mussels with frites is just $16.95 for lunch and dinner. Located at 514 Eighth St. SE, Belga is open daily. Call 202-544-0100 or visit www.belgacafe.com. Nearby, Lola’s, 711 Eighth St. SE, shuttered since last fall, should reopen any day now with a new look and menu. 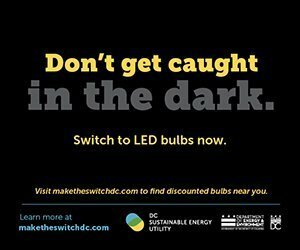 Call 202-547-5652. After that marvelous Hill Rag-sponsored art show at Hill Center on March 8, Peter and I had a pleasant dining experience at Senart’s Oyster & Chop House, 520 Eighth St. SE. 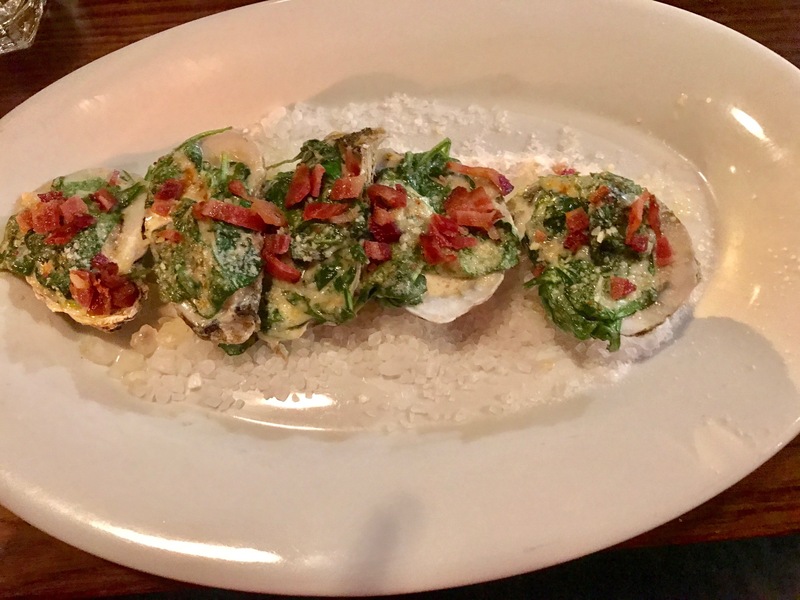 I’ve always liked oysters Rockefeller, that retro concoction invented at New Orleans’ famous Antoine’s. Senart’s is up to the challenge. Tagged at $14, a half-dozen plump oysters, draped with spinach and enriched with butter and bread crumbs, is sublime. (Antoine’s original recipe purportedly contained green vegetables other than spinach.) Senart’s is open daily; call 202-544-1168 or visit www.senartsdc.com. Coming up on April 29 is the annual Barracks Row Taste of 8th. Sponsored by Barracks Row Main Street, the tasty event goes from 1 to 4 p.m. For more information visit www.barracksrow.org. We were disappointed when Radici, 303 Seventh St. SE (at C Street), stopped selling Whisk! quiches. But Radici now bakes its own quiche, sold by the slice ($4) or a whole pie (for about $20). We’ve tasted the vegetarian version and it’s delicious, chock full of mushrooms and other goodies. Radici is open daily; call 202-758-0086. On June 7, from 6 to 10 p.m., Jose Andres’ Dine ‘n’ Dash will welcome celebs Andrew Zimmern and Ted Allen, and you. First buy your ticket at https://dinendash.info and choose a restaurant (see list on the website). Then show up there at 6 p.m. on the night of the event. You’ll receive a wristband entitling you to eat and drink at other Penn Quarter restaurants. Tickets are $125 each ($380 VIP, which lets you into special restaurants and a glitzy reception afterwards). The fundraiser will benefit Jose’s World Central Kitchen, a nonprofit that combats hunger and poverty. Speaking of fundraisers, Dining Out for Life is on April 6. More than 100 local restaurants will donate a portion of their proceeds to Food & Friends, a nonprofit that delivers meals, groceries, and nutrition counseling to persons with HIV/AIDS. For more information call 202-269-6826 or visit ttate@foodandfriends.org. Until next March, Matchboxfoodgroup is joining thousands of restaurants nationwide by donating 10 cents from every Matchbox pizza and 10 cents for every Ted’s Tart (up to $75,000), at all locations, to raise funds for “No Kid Hungry.” For more information visit www.matchboxfoodgroup.com.